This flag has a white border with a red field and is usually square. Thirteen white stars appeared on a blue Saint Andrew's cross edged in white. 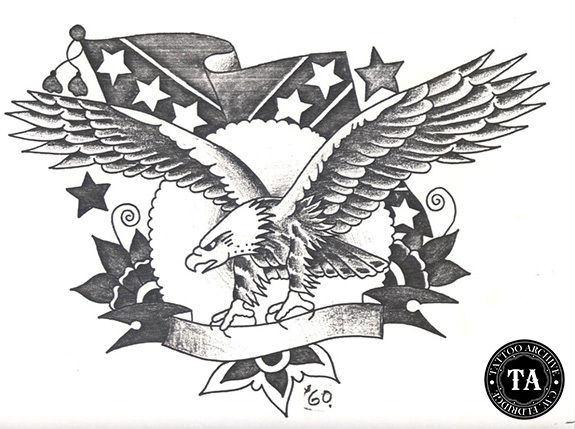 The thirteen stars were for the thirteen states that were to make up the confederacy, but the voting for secession in Kentucky and Missouri was irregular, so the C.S.A. remained at 11 states. It is not known who created this battle flag or how they arrived at the design. Some folks think that the C.S.A. put the St. Andrew's Cross on its flag because of the Scottish heritage of the south. Saint Andrew was one of the first Apostles of Christ and the patron saint for Russia and Scotland. He was a follower of John the Baptist and went through his life leading people to Jesus. Like the Scottish national flag, the Saint Andrew's Cross has been used on flags for centuries. The media prefers to refer to the St. Andrew's Cross on the Confederate battle flag as the letter X. In fact, it is not the letter X but rather a cross. The reason this X shape is known as a Saint Andrew Cross is because the Saint was crucified on an X-shaped cross. 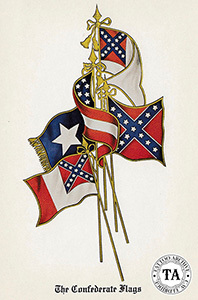 The Confederate Battle Flag gained its offensive reputation during the 1940s when it was taken up as the standard of the Ku Klux Klan. Before that, the Klan used the American flag and Christian crosses as their symbols. It seems that now that anything with the word Confederate in it is a target for abuse. The Confederate Air Force was pressured to changing their name to the Commemorative Air Force because of the latest hoopla over the Confederate flag. They were losing air show bookings because promoters did not want to be associated with anything that had the word Confederate in it.